About one second after power-up the display content is replaced by the mode and frequency in the top row and some more parameters in the bottom row. A blinking cursor shows the digit controlled by the UP and DOWN keys. LEFT and RIGTH keys select the digit. If there is no blinking cursor, then the UP and DOWN keys select the operating mode. The frequency can be adjusted in 10Hz steps from zero up to 999.99999MHz. The software makes no reference to the actual DDS clock frequency at this stage. Therefore the frequency display just means that there will be some spectral component at the indicated value, but it does not tell whether it is the fundamental DDS product or a higher-order image. 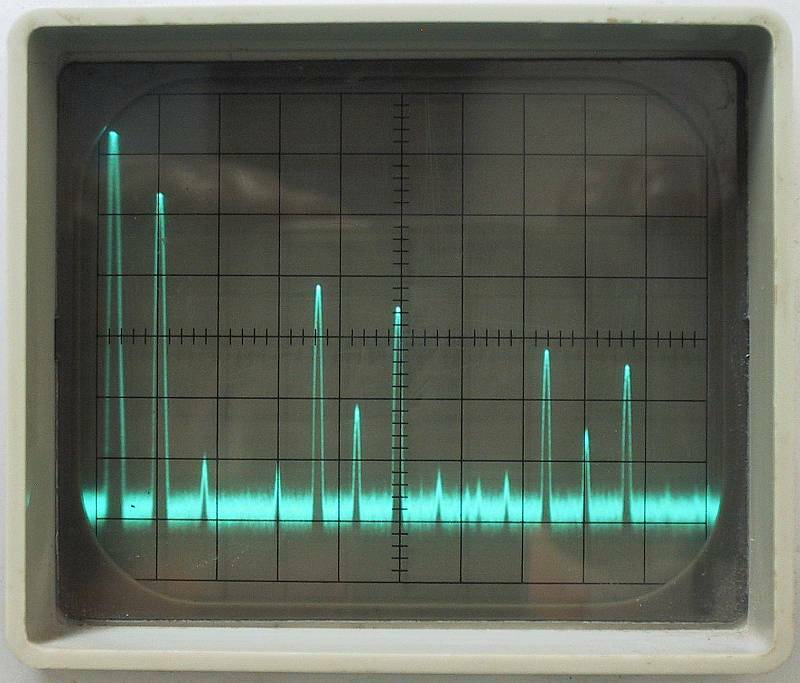 Without any filtering of the RF DDS output, a conventional frequency counter will only show the correct frequency of the lowest (fundamental) spectral line of the DDS when the latter is less than about one third of the DDS clock frequency (less than about 65MHz) in CW mode. In other modes the modulation may interfere with the operation of the counter and this limit may be much lower. All parameters are copied from EEPROM to RAM at power-up RESET. When the DDS RF signal generator is powered up for the first time, the values of all parameters are meaningless and correspond to empty EEPROM locations. Therefore the first operation is to set all parameters in all different menus and most important the DDS clock frequency in the REF menu to some meaningful values and store them in the EEPROM. The highest peak on the left is the DC component, followed by the fundamental DDS signal at 35MHz. Many higher-order images are also visible. The image at 435MHz is less than 30dB below the fundamental signal, therefore this signal generator can be used for testing receivers in the 70cm band and even beyond. Clock crosstalk from the DDS chip at 200MHz and 400MHz is also well visible. The smallest peaks are produced by second-order nonlinearities elsewhere in the analog circuits. Of course, the same output spectrum is obtained if the signal generator is tuned to 35MHz, 165MHz, 235MHz, 365MHz, 435MHz, 565MHz, 635MHz, 765MHz, 835MHz or 965MHz at a nominal DDS clock frequency of 200MHz. In the case of a different DDS clock frequency, the software makes all necessary computations so that there appears a spectral line at the desired frequency. One just has to keep in mind that there are many more lines elsewhere in the output-signal spectrum. Further, any signals close to the DDS clock or its harmonics are rather weak due to the sin(x)/x nulls. When measuring the sensitivity of receivers and transceivers, it makes sense to keep a fixed 20dB SMA attenuator directly on the output connector at all times. This attenuator both reduces further shielding requirements and protects the DDS chip in the case of an unwanted transmitter activation. In any case it is recommended to use double-braid cables like the RG-223 or its teflon equivalents for all connections to and from attenuators while measuring receivers. Additional menus could be developed to generate DTMF, CTCSS or other common signaling tones. A major limitation is represented by the DDS serial programming. The latter takes about 5 microseconds either by using the SPI1 interface or by direct software implementation in the LPC2138. Therefore the DSP interrupt rate can not be much higher than 100kHz in FM mode. Recent DDS chips operate at clock frequencies up to 1GHz with much improved 14bit DACs on their outputs, producing cleaner output signals. All these chips have a similar serial interface to the CPU. Therefore the same LPC2138 microcontroller module could be used to drive new DDS chips, unfortunately including the speed limitations in FM mode.